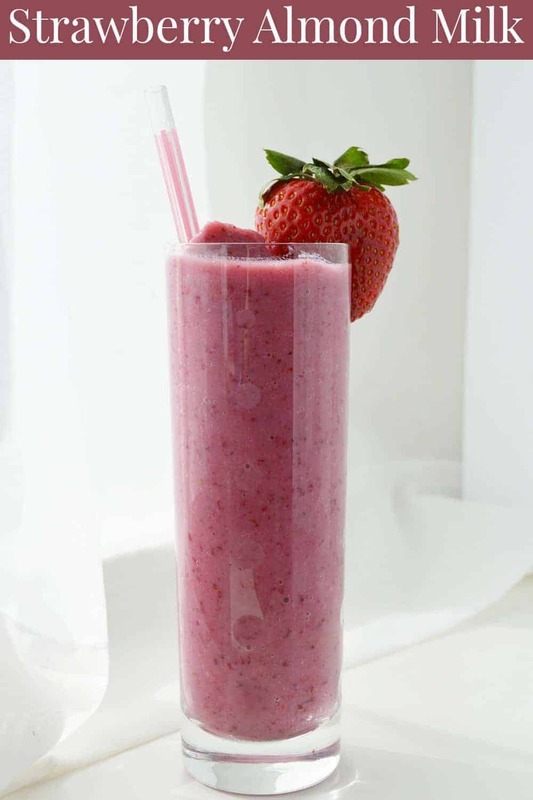 A simple nutritious breakfast can start with this delicious Strawberry Almond Milk Smoothie. Whether you drink this alone or have as a side to your favorite toast, oatmeal or yogurt, this is a great way to get more protein, calcium, and fruit into your diet easily. 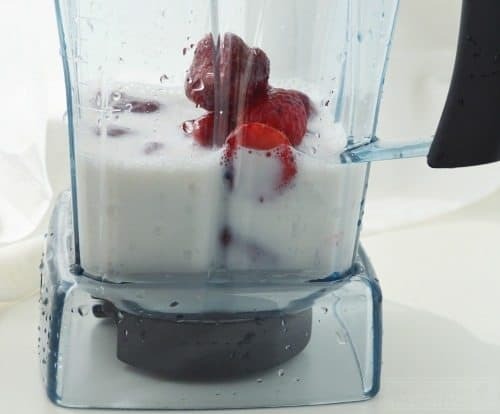 For those who want to drink Almond Milk instead of cow's milk, this method of blending the milk with fresh or frozen fruit really helps to alleviate the lack of sweetness and make it go down easier. This is a favorite and classic flavor that everyone will love. If you are avoiding both grains and dairy, breakfast can turn into a real challenge! Smoothies are a great alternative to a full breakfast and this one only requires two ingredients! Nut milk (almond is most common, but cashew works great too) and strawberries! If you are also trying to avoid refined sugars, this is a great recipe for a yummy almond milk drink that uses natural sweetener to boost flavor. While frozen berries leave you with an even colder beverage, you can easily use fresh berries if available, ripe and on hand. Rinse your berries well, and if using frozen let them stand for a few minutes to soften slightly. We have a Ninja and don't have to let them soften at all. The softer they are, the smoother and creamier you milk will be. Frozen berries, unthawed, turn into more of a smoothie than a milk. Look for local berries that are vine ripened if possible. Late Spring and early Summer are usually the best times to locate local berry farms you can pick fresh strawberries for your personal use. Check into the “you pick” days for discounts and bring the kids along to help you grab the most berries. Not only can you clean and use immediately, strawberries preserve wonderfully when frozen, or made into pies, jams, and jellies. 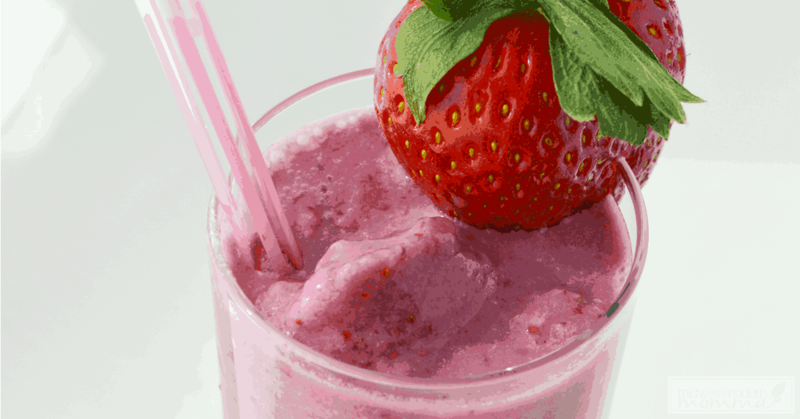 Add your almond milk and strawberries to a blender and pulse in 30-second increments until smooth. If you prefer a chunkier drink, you can lightly pulse leaving bits of berry in the drink. We usually use unsweetened almond milk for this and add a bit of raw honey if it isn't sweet enough after blended. The fresh strawberries should offer plenty of sweetness. If you want, you can also add in some chia seeds, nutritional yeast flakes, or even a bit of organic cocoa powder for a change. This recipe is so simple even your kids can blend it up for you. While it isn't a full nutritional breakfast, it is a great choice when you want something extra to boost calories, vitamins or antioxidants. Almond milk is a great super food to add to your diet, and when coupled with high in antioxidant berries like strawberries you have a great addition to any breakfast or even stand alone snack. If you aren't a fan of strawberries, you should check out my banana almond milk!